We have an IMPORTANT FIX for dealing with recurring challenges we’ve been having with our CPC-1100 tripods. Throughout the pilot project, several spreader-arm brackets at the base of the tripod have been broken as team members tried to spread or close the tripod legs. It turns out that tripods that are most susceptible to this failure mode are those with overtightened bolts at the top end of the tripod. This issue can be quickly and effectively fixed by loosening the nuts on the leg attachment bolts at the top of the tripod. This adjustment was made for the tripods that were brought to the Pasco Training Workshop, and this seemed to fix the problem. We ask that all remaining RECON teams make this one-time tripod adjustment to address this issue. You will need two adjustable crescent wrenches (or a 17mm wrench and a 5/8′ wrench) to loosen the nut. Locate the bolts that connect the legs to the top of the tripod. 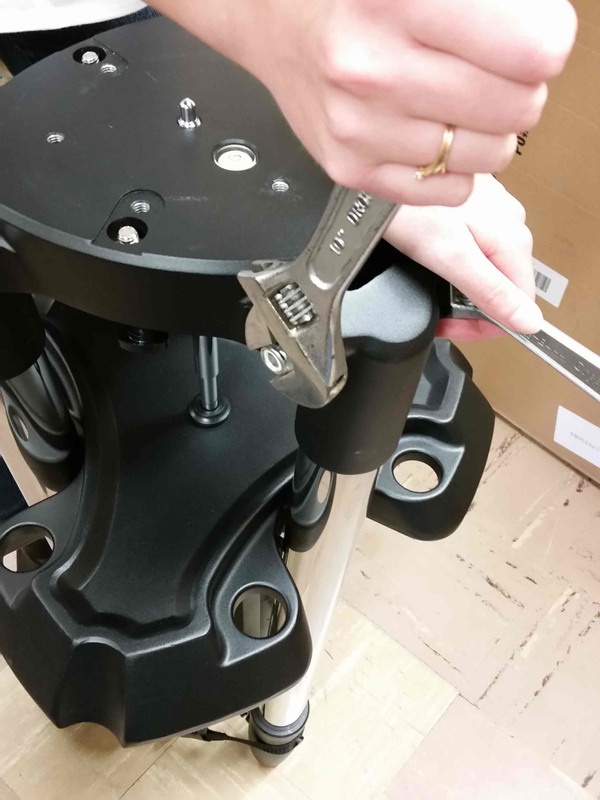 For each tripod leg, use one wrench to secure the bolt and the other wrench to loosen the nut. The nut is nylon-lined and will hold it in place even when loose, but if you go too far it will fall off. On the tightest tripods that were adjusted in Pasco, a full turn of the nut was needed (maybe two). You can’t tell how loose the nut is by turning it due to the nylon. Your best guide is how the legs feel. For those with stiff legs, you’ll feel an immediate difference and the legs should feel loose and willing to open but not wobbly. This is not a very precise adjustment. The goal is to only loosen the bolts enough for easy operation but not too far. For each tripod leg, loosen the nut on the bolt at the top of the leg so that it can open freely. 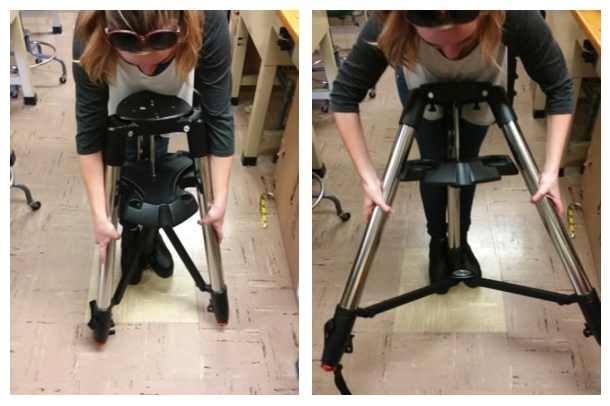 After you have loosened the bolts on all three legs, the tripod legs should open freely, thereby reducing the likelihood of breaking the spreader-arm brackets at the base of the tripod. It is still important to open all three tripod legs at the same time. The two images below demonstrate a preferred technique for accomplishing this task. You can use your feet to secure of of the tripod legs and your arms to spread the other two legs at the same time. Technique for spreading all three tripod legs evenly. Here’s to no more broken tripods!! !